(JTA) — Every year, a sea of a new Haggadahs vies for our attention, money and a seat at our seder table. In the hopes of helping you sort through this year’s crop, here are five of this year’s most compelling new entries. The Israeli art and design collective Asufa mostly works on slickly designed consumer gadgets, like Spredo, a tool for evenly salting and buttering your corn on the cob. But Asufa has also produced a new Haggadah for the last three Passovers. Available for the first time this year through a U.S. distributor, the 2015 installment comprises the work of more than 40 artists, each contributing a two-page spread. Clashing visual styles mimic the riot of voices and generations reflected in the text, which itself is part of the art in its placement, shape and style of font. 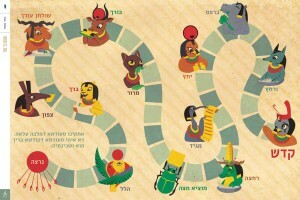 One spread is dominated by a Candy Land-esque board game festooned with cartoonish Egyptian deities acting out the seder. In another spread, the lyrics to “Echad Mi Yodea?” (“Who Knows One?”) are an intricate arrangement of white words and letters twinkling like stars across a black background. The Asufa Haggadah is a stunning mishmash of artistic sensibilities, each spread a feast for the eyes. But Anglophones beware: The classic Hebrew text does not include an English translation. From the Boston-area Jewish special education agency Gateways comes “The Gateways Haggadah,” which is designed to make the seder experience more accessible for and inclusive of members of the Jewish community with special educational needs. 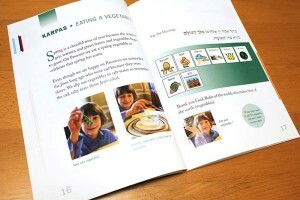 The Haggadah features a “translation” of key passages and instructions into a symbolic communication system developed by the special-needs technology producer Mayer-Johnson. These colorful little ideograms can be arranged in sequence to represent almost any text. 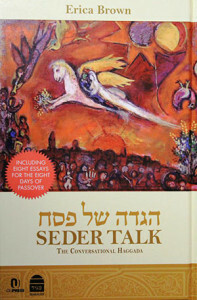 There is insightful material here for seder participants of any experience level, whatever their needs. 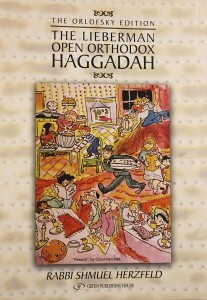 For example, “The Gateways Haggadah” joins the venerable tradition of putting a unique spin on the Four Children of the Passover story by depicting them as four children with differing emotional and cognitive needs. It is not hard to imagine “The Gateways Haggadah” quickly becoming indispensable in Jewish families, day schools and synagogue religious schools in search of greater inclusion of children with educational needs. “The Lieberman Open Orthodox Haggadah” is the first liturgical work produced under the banner of Open Orthodoxy, a movement within modern Orthodoxy toward greater social and intellectual openness, inclusion and liberalism. Open Erica Brown’s “Seder Talk: The Conversational Haggada” from the right and you have a Haggadah; from the left, a book of essays. The Haggadah side is peppered with conversational jumping-off points and commentaries from an eclectic array of sources, from the poet Yehuda Amichai to the classic young adult writer Madeline L’Engle to the Talmud. It’s easy to see what Brown, a writer and educator, means by “Conversational Haggada.” After some of Brown’s commentary on the symbolism of matzah, she asks, “What emotions beside hunger drive you to eat?” The essay side includes eight pieces — one for each day of Passover. The first, “DAY ONE: All Who Are Hungry,” is the perfect reading material for the seder leader, a review of the Jewish cultural importance of hosting others in one’s home. Another essay dives deep into the little-known character of Moses’ wife, Tzipporah. Unfortunately, one is left wishing this were two separate books. The Haggadah is rendered too heavy for use around the seder table by having the eight essays, wonderful in their own right, fused to its back. En quoi cette soirée se distingue-t-elle des autres soirs? Or, for the non-Francophones among us, Why is this night different from all other nights? On this night, perhaps, you’re using the first Canadian Haggadah! Of course, Haggadahs have been produced before in Canada. 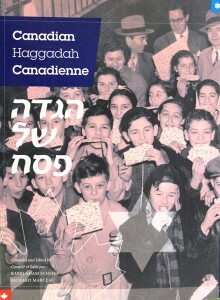 After all, as this one tells us, Canadian Jewry is “the fourth largest Jewish community in the world.” But the “Canadian Haggadah Canadienne” is the first to focus on the history and culture of Canadian Jews. Compiled and edited by Rabbi Adam Scheier of Congregation Shaar Hashomayim in Montreal and Richard Marceau, a former member of the Canadian House of Commons, the “Canadian Haggadah Canadienne” is trilingual — Hebrew, French, English — top to bottom. There is also a complete transliteration of the Hebrew text that will be intelligible to both Anglophones and Francophones. This Haggadah combines an impressive array of archival photos documenting Canadian Jewish history, with an accessible modern commentary by the rabbinic lights of contemporary Canada. The slim, slickly produced volume is an engrossing and informative entry in a long tradition of Haggadahs that tell the story of one particular Jewish community alongside the story of Passover. A former practicing attorney, Shoyer has appeared on the Food Network and Martha Stewart Living Radio and works as a consultant to kosher bakeries. Her latest undertaking is “The New Passover Menu,” a book released on Feb. 3. 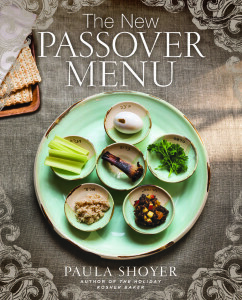 The cover of “The New Passover Menu,” by Paula Shoyer. Credit: The New Passover Menu. “Jews who host the holiday often feel that preparing the house and food for Passover makes them feel a little too much like the Israelite slaves,” Shoyer writes in the book’s introduction. The recipes offered in the book, Shoyer hopes, will change that feeling. Bread, rice, corn, oats, rye, spelt, barley, legumes and pasta all fall under the category of chametz — foods that are forbidden on Passover. But rather than dwelling on prohibited items, Shoyer suggests focusing on what you can eat on Passover. Known for her desserts, Shoyer’s book includes triple-chocolate biscotti, pistachio and strawberry roll, and meringue fruit tarts. “The New Passover Menu” also features an updated Ashkenazic seder menu (with items like fresh salmon gefilte fish loaf with arugula; brisket osso buco; and asparagus, zucchini, and leek kugel), an international seder menu (including Middle Eastern charoset, whole chicken with dried fruit stuffing, and Moroccan spiced short ribs), a Shabbat menu, a Yom Tov menu, a French dairy menu, and more desserts. Shoyer has traveled globally and spent significant time in Switzerland and Paris, where she graduated from the Ritz Escoffier pastry program in 1996. Fittingly, her book has an international flair. Shoyer teaches classes on French pastry-making and Jewish cooking in the Washington, DC, area, and holds demonstrations around the world. Her goal is to make traditional Jewish desserts more contemporary, more interesting, and healthier. Many of her desserts are dairy-free, sugar-free, gluten-free, and vegan. 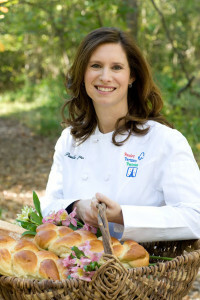 Paula Shoyer, pictured here holding challah, is the author of a new book that includes anything but challah—“The New Passover Menu.” Credit: The New Passover Menu. The Y is looking forward to hearing “some tales from [Shoyer’s] unusual career journey and even some tidbits from her experience competing on the Food Network’s ‘Sweet Genius’ [program],” Chen told JNS.org. Shoyer is planning to write more books, including one on Shabbat cooking and another on desserts, and she also intends to introduce a new frozen Jewish dessert. 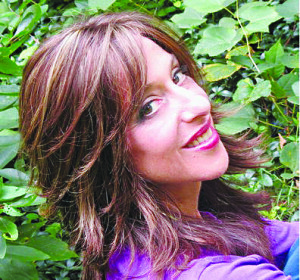 But for now, her focus is on “The New Passover Menu,” with three book events coming up in Chicago in March on top of the 92nd Street Y program. Recently, when visiting Israel to attend a family bar mitzvah, Shoyer held what she called a “food tour” that kicked off at U.S. Ambassador to Israel Dan Shapiro’s residence in Herzliya Pituach. Eighty attended the event, at which Shoyer demonstrated desserts from her three books. In Israel, Shoyer said she was also researching a forthcoming article about the best bakeries in the Jewish state. Asked to divulge a few of those bakeries, she told JNS.org that her top three are the Pe’er bakery and Ness Patisserie in Jerusalem, as well as Tel Aviv’s Careme. Besides offering contemporary recipes, Shoyer’s book includes personal anecdotes such as one titled “Italian Vegetarian Menu,” which is dedicated to her father, Reuben Marcus, who served in the U.S. Army in Italy during World War II. How is this year’s Passover seder different from all other seders? More often than not, the answer might be, “Nothing’s different at all.” David Silberman’s Haggadah offers not one, but six possible solutions for seder participants who are starving to mix things up. 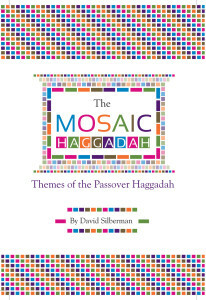 The cover of “The Mosaic Haggadah,” by David Silberman. Credit: Haggadah Publishing. As his children grew older and intellectual discussions became possible, Silberman—a dentist by practice who also teaches a weekly Talmud class at his local congregation, United Orthodox Synagogues of Houston (UOS)—says he was “tired of looking at the various analytical or exegetical explanations that varied from paragraph to paragraph within the Haggadah.” Rather than continuing to slog through the same routine each year, Silberman produced the most proactive solution possible: he compiled his own Haggadah. Published in 2014, “The Mosaic Haggadah” identifies six color-coded themes central to the Passover story—freedom, contemporary (the Haggadah as a modern story), family and community, gratitude, redemption, and Israel—and intersperses essays on those subjects throughout the traditional text, allowing users to follow one theme/color throughout the night. The essays include previously published writings (or speeches and quotes) by names as well-known as David Ben-Gurion, Elie Wiesel, Maimonides, Rabbi Shlomo Riskin, Rabbi Shmuley Boteach, Rabbi David Wolpe, Rabbi Joseph Telushkin, Winston Churchill, Bob Dylan, Abraham Lincoln, Rabbi Adin Steinsaltz, and Natan Sharansky. Other essays in “The Mosaic Haggadah” come from more moderately known or lesser-known scholars, Silberman himself, media outlets, and anonymous sources. “My family and guests received it enthusiastically, so I knew that I had found something different, which allowed everyone to participate in lengthy conversations that went above and beyond the text itself and contributed some depth and meaning to that night,” Silberman tells JNS.org. “It seemed to me that the idea of coming from a foreign land to Israel is an extremely contemporary story that we see every day of our lives, to this very day,” he says. Other themes in “The Mosaic Haggadah,” such as “family and community,” require slightly more interpretation. “The seder has always been a family affair, and the rules of the Passover experience involve that for generations, a family and pre-arranged groups have embraced the Passover seder as one of the most celebrated annual events,” Silberman says. The “contemporary” theme, he says, was inspired by “A Night to Remember: The Haggadah of Contemporary Voices,” a 2007 Haggadah written by Mishael Zion and Noam Zion. How did a dentist come to write a Haggadah? Silberman recalls that when he was 16, his father would bring him—or “perhaps drag me”—to Talmud classes led by Rabbi David Novak in Oklahoma City. Eventually, Silberman fully embraced Talmud study and generally gravitated toward an analytical approach to texts. For the last nine years, Silberman has been leading a Talmud study group on Shabbat for both men and women at Houston’s UOS synagogue. “As my children grew, I adapted the [Haggadah] text and approach to be appropriate for their age… This continued as an intellectual study of the Haggadah itself, which is not very long, so it’s a very embraceable unit of subject matter,” he says. Silberman recommends that each family or group “conduct a seder that’s appropriate for the guests that they have.” He says that “Mosaic Haggadah” users can read as much of the traditional Haggadah text as they’d like in Hebrew or English, choose a theme, and then see how the theme goes for them throughout the night. “If you have very young children, admittedly this Haggadah may not be for them… If the people are the type who are willing to engage in intellectual discussions, then the text of the Haggadah becomes almost secondary to the themes that are presented in this ‘Mosaic Haggadah,’” he says. Ultimately, Silberman hopes “The Mosaic Haggadah” is an easy-to-use book that makes the seder ritual more meaningful, memorable, and modern. Read to your child: When our children are young, we know it is important to read to them; however, even when they can read in those beginning years, reading to them lets them enjoy books and stories that are still too difficult. Plus, it is a very special time together. Let your children see you read: This is a very important step in modeling — it shows what is important to you. Go to the bookstore and the library: Make it a special time and an adventure. My children knew that I would never say “No” to a book! Let me recommend a wonderful book that gives our children an understanding of important values and it is a fun and beautiful as well. Cookies: Bite-Size Life Lessons by Amy Krouse Rosenthal has examples from the process of making chocolate chip cookies. Great concept words are defined: “Cooperate means, How about you add the chips while I stir?” “Trustworthy means, If you ask me to hold your cookie until you come back, when you come back, I will still be holding your cookie.” Now we add our “Jewish overlay” with the Jewish values we want to teach our children. We use the Hebrew words (which in many ways are just as foreign to our children as a word like “compassion”) but those words have deeper meanings filled with our history — so use them! A few years ago, a little boy in the JCC preschool ran up to his teacher saying, “He’s not kavoding me!” What a wonderful demonstration of understanding and using the value of kavod — respect. We want our children to use the words and practice the acts. Let us be the models for them on a daily basis. Photo: TJP Staff Team Levine’s winning meat chili had a “perfect amount of salt,” one of the judges said at the 22nd annual Dallas Kosher Chili Cook-Off. DALLAS — Sunday, a team of volunteers from Ann & Nate Levine Academy won this year’s bragging rights for preparing the best bowl of kosher chili in Dallas. As the 22nd annual Dallas Kosher Chili Cook-off drew to a close Sunday, Team Levine took both first place and the “People’s Choice,” while second place went to Henry Litoff — for the second year in a row. Third went to Legacy Communities. In the vegetarian chili category, the Dallas Holocaust Museum/Center for Education and Tolerance team netted first place, with Whole Foods taking second. Well over 4,000 people — one of the largest crowds ever, according to officials — attended Sunday’s event, said Ed Jerome, Tiferet past president and cook-off co-chair with Shirley Rovinsky and Diane Goldblatt. Sunday was an incredibly sunny, crowded day at the cook-off. Many people parked at the Jewish Community Center on Northaven Road and took the free shuttle bus to the seven-hour event. It took about 300 volunteers, nearly 50 teams and 30 vendors to make this happen without “professional” assistance, Jerome said. The event sported the usual concession stands, games, rides, vendors and a silent auction. The music of the day — or as Jerome put it, “the official sound of the chili cook-off” — came from the Mazik Brothers, a band formed in 2003 by Jim Schwartz and Rusty Cooper that includes drummer Rob Shrell and bassist Joel Fudderman. The band, which focuses on songs from ’60s, ’70s and ’80s, has played at the event for the past 11 years, officials said. All chili, incidentally, remained kosher and under supervision of Dallas Kosher. Preparation included the beef, tons of vegetables and seasoning. Vegetarian chili was the same — except, obviously, no beef. Back to the winning moments: Rabbi Matt Rutta with Levine was walking away from the front stage and was far too preoccupied with the good news of his team’s first-place win to hear Ed Jerome subsequently announce that they also won People’s Choice. So the good rabbi just kept walking until members of his team stopped him and shared the second round of good news. The team won third place last year. Michelle Feinberg, senior admissions officer at Levine, was quick to share that Team Levine’s winning chili was a masterful combination of carefully measured spices, the “perfect amount of salt” — and the blessing of Rabbi Rutta. Levine Development Director Melissa Gendason agreed with Feinberg’s chili assessment. “The chili has that ‘Levine special sauce’ that made it fabulous,” she said with a smile. Rabbi Rutta said he couldn’t be prouder of Team Levine. Second placer Henry Litoff, 30, is an Indian food aficionado who works in his family’s real estate business with his brother Austin. Austin also competed Sunday. Litoff said he tries to stay away from making gimmicky chili. Litoff said this year he had some trouble getting a working burner, which put him behind schedule a bit, but soon he was trucking along. He was in the chili-making zone: Meat. Tomatoes. Onions. No beans. Unlike his brother, Austin attended culinary school in Israel awhile back. Austin’s idea of good chili is traditional spices, chili powder, some lime juice and thoughtful recipes. “I like a meaty, creamy chili,” Austin said. Although they didn’t place Sunday, disappointed aficionados could be heard chanting “Moishe House! Moishe House!” as the awards were being read out. Tiferet Israel’s vegetarian chili cook-off team did not place this year either, but was first in the vegetarian category in 2014. Solomon Israel of Tiferet Israel said he is a particular fan of the vegetarian category because it allows people who don’t eat meat to still enjoy the goodness of Texas chili. Diane Benjamin, a past co-chair of the event and Texas region president of Bnai Zion, helped man the Bnai Zion booth, which sold nail polish and beauty aids to support Bnai Zion’s efforts in Israel. Deborah Linksman, daughter of the late Mike Jacobs, founder of the Dallas Holocaust Museum/Center for Education and Tolerance, sold about 15 copies of her late father’s book, Holocaust Survivor: Mike Jacobs’ Triumph over Tragedy at the chili cook-off. The book has seen 11 printings. Mike Jacobs died July 28, 2014 at age 89. Charities sharing in the proceeds of the event this year were the JCC Maccabi Games and the Friends of the Israel Defense Forces. 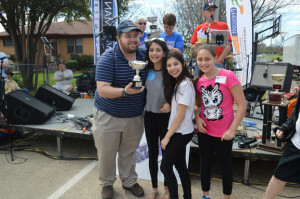 Scott Kammerman, executive director of the Texas Chapter of the Friends of the IDF, gave the 22nd annual Dallas Kosher Chili Cook-off extremely high marks. “There are a number of chili cook-offs in any number of cities, but this is the original and best for a reason,” he told the audience just before the awards were announced Sunday. Dallas Morning News columnist Steve Blow, one of the 10 judges for the chili competition, joked that heartburn is a small price to pay for all the good chili he got to sample Sunday. “I was amazed how consistently good the entries were. Is kosher a secret ingredient?” he said in an email to the TJP. Max Glauben will be the featured speaker at 6:30 p.m., April 6 when TCU presents its annual Holocaust Museum, April 6-8. Admission to all events is free, and limited free parking is available across the street from the Union, which is located at 2901 Stadium Drive. Glauben last spoke at the TCU Holocaust Museum on April 12, 2011. He has been profiled in the TJP numerous times. He is an active volunteer in the Dallas Jewish community and for the Dallas Holocaust Museum/Center for Education and Tolerance. He continually lectures on the Holocaust in schools, churches, colleges and various organizations and institutions. Last February, he was the subject of a number of local news stories when his car was broken into and artifacts he uses for his presentations were stolen. They were not returned. Glauben was born in 1928 in Warsaw, Poland. He attended an ATID school until his education was interrupted in 1939, when he and his family were forced into the Warsaw Ghetto. He lived there for three years until the Warsaw Ghetto Uprising. After the Nazis destroyed the ghetto, he and his family were transported via boxcars to the Majdanek gas chambers and crematoriums, where most of his family perished. Only Max and his father were selected for slave labor or Budzyn Concentration Camp. After three weeks, his father was killed. Max was sent to Mielec, Wieliczka and Flossenburg concentration camps. On April 23, 1945, while Max was on a death march to Dachau from Flossenburg, he was liberated by a Jewish soldier in the United States Army. In December 1947, at the age of 19, he came to New York, then later to Atlanta, Georgia. He was drafted into the United States Army in 1951. He received basic training at Fort Hood, where he served his two-year tour of duty during the Korean War. In 1953 he received an honorable discharge and settled in Dallas, where he married Frieda Gappelberg. He worked at Neiman Marcus and Southwest Toys until he joined as a partner at Imperial Garment Supply and National Embroidery Inc. He retired at the age of 75. He is an active member of Congregation Shearith Israel and a life member of its brotherhood. He is a past recipient of Shearith’s Torah Fund award. Max is a member of the Jewish War Veterans, an associate member of the Dallas chapter of Hadassah and a life member of the board of directors of the Dallas Holocaust Museum. He received Hadassah’s Myrtle Wreath Award in 1989 for his humanitarian work on behalf of the Holocaust. He has completed a documentary, Plagues of the Soul, to be used as a teaching aid. Max has accompanied Yavneh high school students on the March of the Living for nine of the past 10 years and plans to go again this year. Max and Frieda have two sons and a daughter, and seven grandchildren. 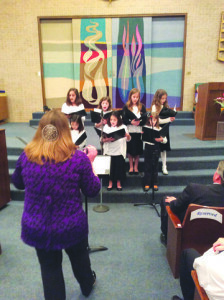 Photo: TJP Staff Compassionate Fort Worth Cantor Shoshana Abrams Kaikov leads the Congregation Ahavath Sholom Youth Choir at Compassionate Fort Worth. Sunday, April 12 is a big day for the Jewish Federation of Fort Worth & Tarrant County! The Federation’s annual Tzedakah Sunday call-a-thon will take place from 11 a.m. to 3:30 p.m., at Congregation Ahavath Sholom. By picking up the phone, you will help answer the needs of the Jewish world. Later that evening, you won’t want to miss the Community Campaign Event and dessert reception at 7 p.m. at Colonial Country Club, featuring Mega Mentalist Sidney Friedman. Friedman has been seen on shows such as ABC’s 20/20, NBC’s Today Show and Fox News. Forbes magazine has called him the “Mentalist to the Stars.” Sidney has astounded audiences throughout the country. Cost to attend is a pledge to the Federation Annual Campaign by the end of the evening. The campaign event is co-chaired by Irwin and Lea Ann Blum and David and Elisa Nudleman. To volunteer for Tzedakah Sunday and/or RSVP for Sidney Friedman, please call the Federation office at 817-569-0892 or email jfed@tarrantfederation.org. I would like to share some of the responses received to date in answer to my question/challenge: Why be Jewish? Please take a good look at these thoughtful replies and let’s keep ’em comin’ and keep the dialogue going! Because being Jewish is a belief that there’s a system of behavior that matters and an awareness of the fact that we strengthen one another and help one another grow to be even better than we were yesterday. In fact, being Jewish is a life filled with purpose and meaning. The greatest gift my parents gave to me (other than the gift of life) is my Jewish birth. For while life allows me the opportunity to fulfill my mission in the physical realm, my Jewishness insures my survival and growth potential in the spiritual realm. It is reassuring and reconfirming to me to know that I am a link in a continuum and tradition that goes back 3,500 years and the bridge between my ancestors and my children. I take pride in the fact that I am a part of a people that introduced the concept of ethical monotheism to the world and whose mission it is to bring the Kingdom of Heaven down to Earth. The affirmation of one God is the unity principle that is the foundation of Jewish faith. Through mitzvot, acts of kindness, repairing the brokenness in the world, ritual and prayer we can develop a personal relationship with God. The doing of mitzvot helps me to become a more moral and compassionate human being. Judaism transforms daily routine (the long haul of life) into sacred moments and sacred opportunities, helping to moor us in what is sometimes an anchorless world. For Jews, deed is more important than creed. What people do is more important than what they believe. Judaism encourages questioning and debate. There are often multiple right answers to difficult questions and various points-of-view are encouraged. Judaism fosters Jewish pride, as well as an ethnicity that connects Jews with one another, a connection that transcends any geographic border or time and space. Judaism emphasizes lifelong personal and educational growth. Jewish education helps us to morally navigate the world and to grow in traits such as kindness, generosity, justice, and mercy. Jews have a spiritual and historical connection to Israel. Its capital, Jerusalem, is the center of the Jewish spiritual world, where according to rabbinic teaching, heaven and earth touch. As a Jew, I can be part of the ancient and continuing story of the Jewish people. This story moves forward in history and will eventually bring us to the messianic period. — Rabbi Kerry M. O. Last week I explained here how the Israeli electoral system works. A high percentage of Israeli citizens participated in the fully democratic process, the votes were counted, there were very few appeals to the Central Election Committee and the final tally was officially announced and recorded. Ever since the announcement last week, many prominent commentators, both in Israel and here, have been trying to explain the decisive victory of the Likud Party headed by Bibi Netanyahu over the Zionist Camp party headed by Yitzhak Herzog and Tzipi Livni. Numerous respectable polls during the weeks leading up to the elections persistently showed parity between the right-wing Likud and the left-wing Zionist Camp party, even after Bibi’s powerful, if controversial, speech before Congress. Though nuances may differ, depending on one’s own political perspective, the Israelis understand, have internalized, and are moving on (some joyfully, others apprehensively) in what is actually a pretty familiar political situation. But many American commentators, politicians and so-called “experts” either don’t understand, or just don’t want to take the time to understand, the subtle shades and tones of the motivating dynamics of the Israeli voter. Security: In its 67 years of existence, tiny Israel has fought 10 full-blown wars, conducted numerous overt and covert operations against terrorist organizations dedicated to its destruction and suffered hundreds of fatal terrorist attacks and rocket and mortar fire against civilians in their homes, riding buses or driving on the roads. Security and national survival are the most important issues considered by Israelis in any election. In this election this was even more important because of the current inevitability of Iran having nuclear weapons in the very near future combined with its brutal taking over of Arab countries in the region, the deterioration of hitherto stable regimes in the Middle East, the growth and expansion of ISIS on Israel’s doorstep, the strengthening of al-Qaida…and the pervading, growing perception (whether true or not…) that America is, at best, slowly abandoning its traditional friends in the Middle East (including Israel) or at worst, is planning an alliance with Iran. Right equals hawkish: Peace with all neighbors through negotiations, stronger deterrence, pre-emptive operations, regional security and defense coalitions, preferential allocations to improving the IDF and Intelligence networks, etc. Left equals dovish: Peace with all neighbors by negotiations, stronger deterrence, pre-emptive operations, regional security and defense coalitions, preferential allocations to economic needs. Both Likud and the Zionist Camp are on the record in full support of an ultimate “two-state” resolution to the Israeli-Palestinian conflict. It has to be negotiated with a credible leader who has the support of a majority of the Palestinians and most of the Arab heads of state (for the “Arab Plan” to kick-in). Abu Mazen has neither. The Palestinian State must be demilitarized. Israel maintains control of all air-space and air-waves. The eastern ridge of Samaria and the Jordan Valley remain under IDF control. Gaza and the West Bank are one package (no “three-state” solution”). That current Palestinian President Mahmoud Abbas (Abu Mazen) does not have the authority to deliver on an agreement, even if he had the will to sign one. So Netanyahu’s answer to an Israeli reporter’s question published the day before the election was accurate, according to both parties. Since Abu Mazen cannot deliver on an agreement, and Hamas will quickly take over any area evacuated by Israel (just like in Gaza in 2005), then this is not the time to make a deal. Bibi: “I think that anyone who is going to establish a Palestinian state today and evacuate lands is giving attack grounds to the radical Islam against the state of Israel. Anyone who ignores this is sticking his head in the sand. The left does this time and time again,” Netanyahu said. Netanyahu was then asked specifically whether he meant that a Palestinian state would not be established if he were re-elected prime minister. He answered, “Correct.” OK ­— here he could have qualified his answer a bit better. But was this why Likud won the elections? Not according to the analysts. In fact a poll taken by Likud over the weekend, but not allowed to be published two days before the election, showed that Likud would win with a comfortable margin of between five to seven seats. Security is issue No. 1, and despite the fact that Herzog’s security “credentials” are better than Bibi’s, his campaign failed to emphasize it. Joining up with Tzipi Livni, who is not popular among most Israelis, probably cost Herzog the election. The last-minute canceling of their rotation agreement did not help. Israeli society today is split between those who have more and those who have less. This was cleverly projected in Likud campaign ads in this election as “Tel Aviv” (Herzog) versus “the rest of the country” (Likud). Bibi’s campaign emphasized the threats facing Israel from Iran, Hamas, Fatah, Hezbollah, Iran, ISIS, al-Qaida, and did I mention Iran? Herzog’s campaign emphasized social and economic issues, as well as security. But perhaps the most important issue that moved many still hesitating to vote for Likud, even if they don’t really like Bibi (does anyone? ), was the prominent publicity given in Israel’s media outlets to the brazen and heavy-handed way that the White House gave thousands of dollars to a get-out-the-vote left-wing organization called V15, and sent Obama’s top campaign advisors to Israel help Herzog’s National Camp party overthrow Bibi and the Likud leadership. In exit interviews, voters said that the U.S. administration’s attempt to influence the elections, with U.S. taxpayers’ money, was the ultimate definition of “chutzpah” — and the main reason they voted Likud. Israelis are proud, independent and don’t like others, especially those who are clueless, telling them what to do. I hope that the lesson has been learned: Chicago rules don’t apply to Israel. Lt. Col. (IDF res) Gil Elan is President and CEO of the Southwest Jewish Congress, and a Middle East analyst. Email: gil@swjc.org. Upcoming briefings and SWJC events are listed at: www.swjc.org. 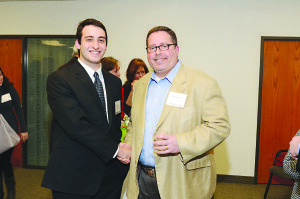 Photo: Courtesy of DJCF SMU freshman Aaron Tverye (left) is greeted by Brad Roth, co-chair of the DJCF College Scholarship Committee. Reviewing scholarship applications The Dallas Jewish Community Foundation College Scholarship Committee is hard at work reviewing more than 100 applications for more than $130,000 in scholarship awards. Since the committee individually reviews each application, the group got together before the process began, to meet each other and visit with some current scholarship recipients. The scholarship reception will be at 7 p.m., Monday, May 18 at Temple Shalom. Details can be found at www.djcf.org. Arkush, who is also a professor of Judaic studies at Binghamton University, will analyze and provide commentary on the current conversation about Diaspora-Israel relations in both the U.S. and Israel, drawing on contributions from Washington Post columnist Richard Cohen, Boston College Professor Alan Wolfe and Tel Aviv University Emeritus Professor Shlomo Sand. The University of Dallas in cooperation with the Center for Jewish Education of the Jewish Federation of Greater Dallas and the Jewish and Israel Studies Program of the University of North Texas will sponsor the event. Attendance is free to the public. For additional information, contact Dr. Joshua Parens at 972-721-5241 or by email at jparens@udallas.edu. Dallas is very lucky to have an active chapter of the Jewish War Veterans and Jewish War Veterans Auxiliary, The Harvey J. Bloom Post No. 256, which volunteers monthly to facilitate bingo games for our veterans at the VA hospital. We have heard that the group donated new bingo cards, snacks, drinks and cash prizes over the course of many years. Last month the group was able to include some nice prizes donated by the confirmation class of Congregation Anshai Torah as well as students from Ann & Nate Levine Academy. These young people decorated shoeboxes and filled them with toiletries and playing cards in addition to notes of thanks for their service to our country. Although they were to be sent to active-duty soldiers, the JWV received so many that they were able to use some for prizes at the VA as well. These boxes were a “big hit,” stated Sandra Cantor (especially the personal notes of thanks). For additional information about the organization, please contact Allan Cantor, Commander of Jewish War Veterans of America, Post No. 256 at acantor0299@gmail.com. “On behalf of the VA North Texas Health Care System, I would like to thank you and the members of Jewish War Veterans Post 256 for your donation of food, refreshments, and shoe boxes filled with toiletries and hygiene products, and $100.00 cash that you distributed to our Veterans during bingo on February 22, 2015. “VA North Texas Health Care System provided no goods or services in return for your contribution. “The support that you have given to provide the Veterans with enjoyable recreational activities is to be commended. Your assistance contributes significantly toward their well-being. It has been a long time, but I especially remember the excitement in the air as all four of the Davidsohn offspring celebrated their AZA and BBG “nom period” which resulted in the selection of new Sweethearts and Beaus for their chapters. David Berger AZA: Hannah Calechman; Louis D. Brandeis AZA: Lexi Van Creveld; Eamonn Lacey AZA: Maddie Karesh; Morton Lewis AZA: Maddie Weiner; Henry Monsky AZA: Sophie Kellner; Rubin Kaplan AZA: Tammy Schisler; Sally Blum BBG: Yoav Ilan; Judy Kravitz BBG: Ryan Sukenik; Fannie Sablosky BBG: Max Feist; Reba Wadel BBG: Gavin Shrell; Ginny Weinstein BBG: Josh Collins; and Jennie Zesmer BBG: Mitchell Levinson.Congratulations to the outgoing sweethearts and beaus and their families. David Berger AZA: Kevin Burck; Louis D. Brandeis AZA: Nick Cera; Eamonn Lacey AZA: Joey Saks; Morton Lewis AZA: Rich Ciarletta; Henry Monsky AZA: Lane Topletz; Rubin Kaplan AZA: Ryan Bredow; Sally Blum BBG: Sabrina Opas; Judy Kravitz BBG: Julie Kursh; Fannie Sablosky BBG: Erica Shea; Reba Wadel BBG: Elysa Tyson & Barri Silverberg; Ginny Weinstein BBG: Monica Leibowitz & Abby Tarlo; Jennie Zesmer BBG: Rose Berg; Nona Bloch Salomon BBG: Mimi Tarrash, Molly Berger, Sarah Berger, Evan Fadem, Terry Marcum and Gena Pollack; and Feenberg Rubin AZA: Joel Langston, Matt Katz, Brad Sanditen, Aaron Miller and Ross Heyman. Are you looking for a fun-filled evening appropriate for youngsters 10-110? At 7 p.m. Saturday, April 11, Congregation Adat Chaverim, located at 6300 Independence Pkwy. in Plano, will host “this exciting, fun-filled event” which will feature a slide presentation by Jeremy Shorr, followed by a Q&A and a dessert reception. Guests are encouraged to come dressed as their favorite or most original superhero. Prizes will be awarded. The winner of a raffle will receive an original oil painting of Batman by renowned Texas artist, Bob Wilson, whose work can be viewed at The Artists’ Showplace Gallery in Dallas. Tickets ($8 in advance, or $10 at the door) may be purchased in advance by contacting Adat Chaverim at 972-491-5917, or online at office@AdatChaverim.org. Raffle tickets may be purchased singly for $5 or 3 for $10 at the door. For additional information, contact the synagogue office at 972-491-5917. Learning to perceive our experience through the lens of joy and especially laughter reveals an alternative vision — to seriously detach from our present experience and re-frame our perceptions. The evening is guaranteed to shake up your status quo, shift your mindset, re-examine your priorities and accelerate greatness. The program begins at 7 p.m.
Those attending will be treated to “Laugh, Laugh And Laugh Some More . . . Laughter, Joy Improv and Play” with Leslie Russell, M.A., founder and CEO of Joy Breaks Barriers. For additional information or reservations, please contact Rivkie Block at www.rblock@chabadplano.org. Fresh off a decisive election victory, Israeli Prime Minister Benjamin Netanyahu finds himself in yet another diplomatic storm with U.S. President Barack Obama over pre-election comments that a Palestinian state would not be established under his watch. Netanyahu later clarified that he wants “a sustainable, peaceful two-state solution.” But were his initial remarks even a policy change in the first place? Within Israel, both supporters and opponents of Netanyahu agree with the prime minister’s self-assessment. Those statements jumped to the top of both Israeli and international headlines, giving the strong impression that Netanyahu’s upcoming term would take a harder line on Israeli-Palestinian negotiations than his last two terms. Yet even Netanyahu’s opponents on the left are not up in arms over the policy ramifications of his recent comments. Netanyahu then added some caveats. “If we receive this guarantee regarding demilitarization and Israel’s security needs, and if the Palestinians recognize Israel as the state of the Jewish people, then we will be ready in a future peace agreement to reach a solution where a demilitarized Palestinian state exists alongside the Jewish state,” he said. A closer look at the newly dissected and debated 2009 speech indicates a strong hesitancy to rush Israel toward the types of historic compromises the Jewish state would need to make to facilitate the creation of Palestinian state. “The claim that territorial withdrawals will bring peace with the Palestinians, or at least advance peace, has up till now not stood the test of reality,” Netanyahu said at the time. Sher, who served as a lead negotiator in talks with the Palestinians under former prime minister Ehud Barak at Camp David and in several other rounds of both known and covert negotiations, believes Netanyahu’s 2009 speech never intended to lay the groundwork for a realistic two-state solution. “Basically what he did in practice is delegitimize the two-state solution, delegitimize and undermine the negotiations process, and that is the subtext of his Bar-Ilan speech—and the subtext is obviously what became the text of his speech prior to the recent election,” Sher told JNS.org. Days after his election win, the mainstream media again cast Netanyahu as a “flip-flopper” when he reaffirmed his support for a two-state solution. The prime minister, however, told NBC News that what had changed were not his views, but “the reality” on the ground. The question that remains both within Israel and abroad relates to Netanyahu’s caveats for a two-state solution — Palestinian demilitarization and recognition of Israel as a Jewish state. Are those caveats the honest outcomes of a well-intentioned peace accord, or is likely Palestinian rejection of those conditions meant to serve as the basis for the prime minister’s never signing an accord in the first place? The Begin-Sadat Center’s Inbar concurs with Sher’s assessment, but he places the blame for the failure to negotiate squarely on the Palestinians. “The Palestinian national movement is dysfunctional, and I don’t think it is ready for historic consequences with the Zionist movement. … The unwillingness to recognize Israel as a Jewish state is what keeps the Palestinians away from negotiations,” Inbar said.